Satoko was born on September 10th, 1982. Starting drumming at the age of 13, she participated in a variety of different bands and sessions. Starting in 2003, she began activities with her own rock band FUZZY CONTROL. She was in charge of the drums, chorus, and lyrics. While recording music and performing in live concerts, she also carried out drum workshops across the country. In addition, she supports many other artists including DREAMS COME TRUE, Koushi Inaba, Koji Kikkawa, DAITA, Kana Hanazawa, Suga Shikao, Sayaka Yamamoto, Maki Ohguro among others. 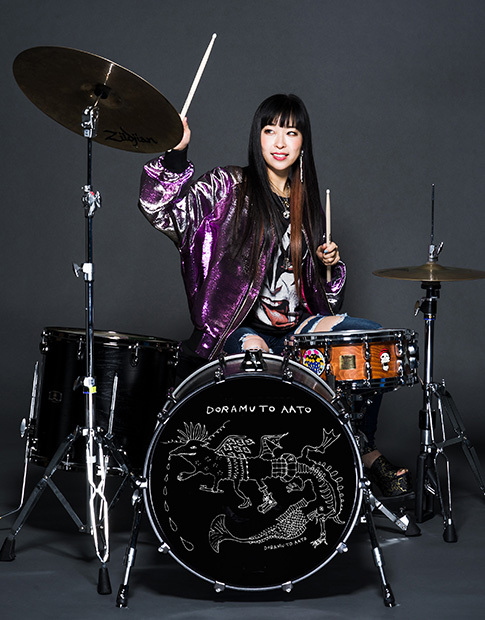 She uses a modified drum set since she is left-handed. In 2013, she published her first book, “The Adventuring Dragon With A Tiny Will” (Kobunsha). She began showing her strength as a writer. Since 2015 she has begun holding individual art exhibitions. She is now venturing into new fields as an author and artist, making great efforts toward her writing activities. She is also active overseas. On August 2017 she will perform in the Jinbao Music Festival. She is also active overseas. She performed in China, Taiwan, Singapore in 2017.